Mama Deak Speaks: I Got It! It wasn't the first time he's said it and it certainly won't be the last, but it did catch me off guard - both for its timing and gentleness. 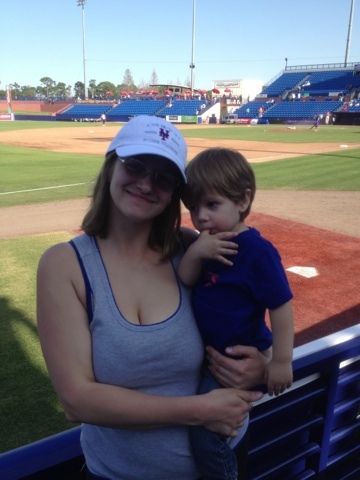 It was about halfway through the little guy's first Mets Spring Training game when he touched my leg to get my attention, pulled me towards him, uttered those heartbreaking words, and then planted a sweet kiss right on my lips. "I miss Daddy, too," I whispered back, using every fiber of my being to not break down. Images of my own time at Spring Training with Joe flashed through my mind. Such happy, happy times. What was it that made his son think of him in that moment? I don't think I'll ever know. But what I do know is what happened next. Our seats were just 3 rows from the Mets bullpen so throughout the game we had been watching the pitchers, catchers, and their coaches throwing the ball around and for just as long the little guy was trying to get them to throw him a ball. In the way that only he can he shouted, "Hey guys, I can't reach it!" or "Guys, can I got the ball?" He was relentless. It was cute, but aside from the occasional smile or glance it didn't seem like any of them even noticed him. Then, not long after the "I miss Daddy" incident, wouldn't you know it Dave Racaniello comes over baseball in hand and stares right up at me and Domani. I couldn't get the tray of food and drink bottles out of my hands fast enough. 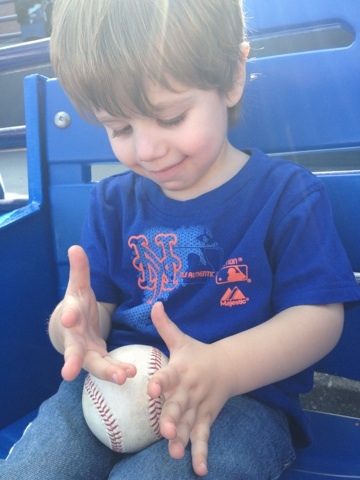 He tossed the ball over to us and when I handed Domani the baseball my little boy was over the moon. I felt the tears welling up as the sequence of events finally sunk in. I was sad in part because I felt like getting your first baseball from a major leaguer should be a moment you share with your dad and Domani lives in the very painful reality where he doesn't get to do that. But then. as the game continued on and we cheered together and he said silly things (like "The juice came out!" every single time he chewed a piece of fruit) I realized how very important it is that I am sharing these firsts with him. I also realized that somehow he WAS sharing that moment with his dad - I just may not understand it fully. I can't get the words out, here, because I am crying. But, just thank you for sharing this. It was amazing to read.